If you’ve watched Liberty and Justice: A Cautionary Tale in the Land of the Free, you’ve seen the history lesson near the end with morphing costumes of iconic authoritarian figures through time. 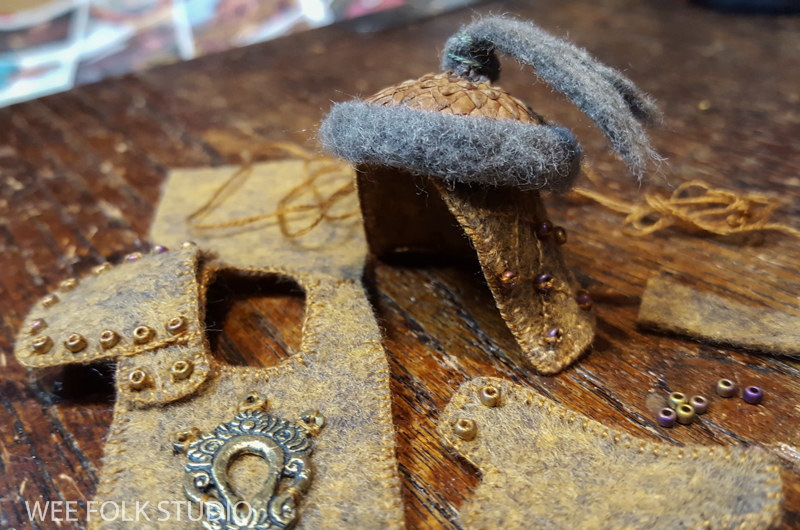 Later in this post, I’ll show process photos of some of the costumes. 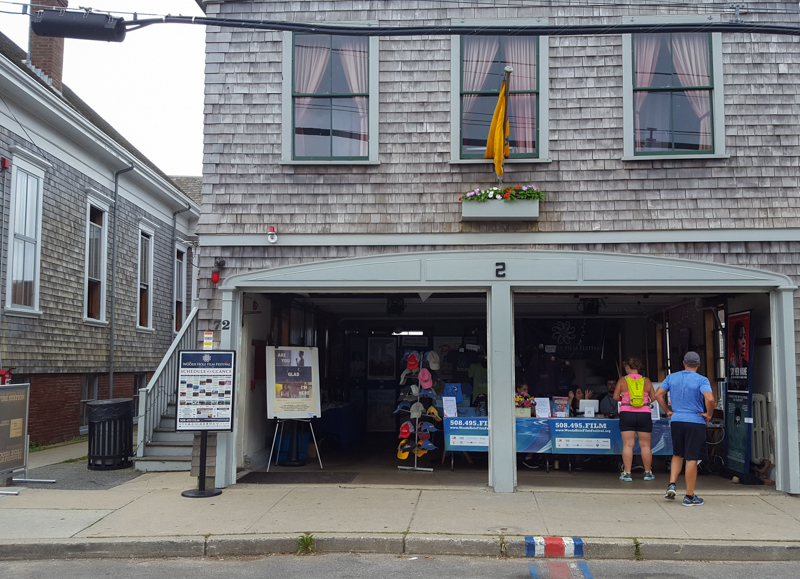 But first, I want to say a little something about the Woods Hole Film Festival, where our film had its film festival premiere last week. I am also excited to announce that our film received an Audience Award for best animated short at the festival awards party last night. Rob and I almost didn’t go because it was past my bedtime, the music would be too loud, etc. But, I’m glad we pushed past my old lady complaints and went anyway! And now the costumes. Let’s start with the innocent protagonists, Liberty and Justice, who are modeled after Hansel and Gretel. With a few exceptions like their hands and feet, their bodies are made the same way as the dolls in my how-to book, Felt Wee Folk. This is the title set, where I animated Liberty dropping bread crumbs (stone cut oatmeal) in the shape of letters. The dolls’ wire armatures help articulate movements with tiny bends and adjustments. Their heads are loose, so they can swivel back and forth on their pipe cleaner necks. It was very helpful to refer to the monitor during filming, so I could see the camera view. At 24 frames per second, I moved the figures about a 16th of an inch or less for every shot. And now for the despots. After researching various kings and dictators, I picked ones with clearly identifiable uniforms, mannerisms and ruthless reputations. Researching and making their costumes was a liberating experience, as I confronted and engaged with these iconic strongmen. There’s something satisfying and even subversive about having bad guys cut down to size. We loom large over them, as they are exposed and held captive in miniature scale and for a moment, their power is diminished. I’m sure you can guess who some of these are. Please see the rolling credits at the end of the movie for a list of characters in order of appearance. 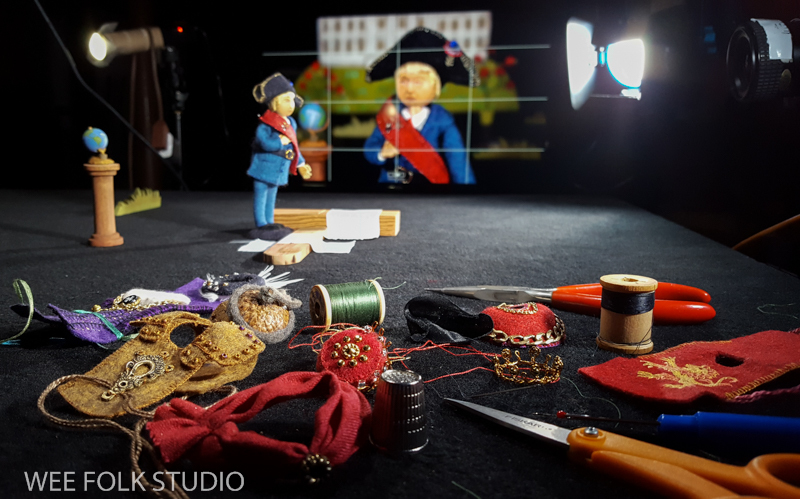 This entry was posted in Animation, Dolls, Embroidery, Liberty and Justice film by Salley Mavor. Bookmark the permalink. I loved the movie and I love seeing the process still. I am always amazed by your work and talent. Thank you for your kind words Mary. As I sit sewing alone for hours on end, it’s really nice to know that there are appreciative individuals out there! I love your animated movie and the statement it made. You are a talent to be sure! So awe-inspiring to see more of the props and details that you have so artfully created and used in this delightful, thought provoking, adorable and frightening short animated film! My words cannot express just exactly what it is about this film that intrigues me. Could it be hope? Could it be exposure? Could it be a look into our current political system? I want to laugh and cry at the same time. Love it! Thank you Barbara, you have done a fine job of expressing your thoughts here. I suppose it’s all of the things you mentioned. Oh Salley I wish I’d been there to see the audience reaction to your film. How brilliant!! I think humour is a powerful way to deal with awfulness and bleak times! Your work has an ever increasing sophistication and depth.I love seeing your works, and those gorgeous characters.Can’t wait to get your new book.Your books are by my armchair and I often look through them,They make me smile, and give me so much enjoyment! Thank you dear lady! Thank you Judith. Oh my, your words are so touching. Your work is AMAZING!!!!!!! I love it!!!! You are a genius. I am so glad you exist. Your work is so extraordinary! I love getting your posts. Your costumes are so detailed, just wonderful! Congratulations. I’m sorry I was out of town and couldn’t go. Where will your film go next? I now the feeling well about bedtimes and too much going on. Glad you persevered and wonderful about the award! I wish your little film could be seen by more people–such a labor of love and was such a breath. of laughter while you were creating the characters and scenes week by week. There are so many resistors and persistors who would love it!! Thank you Janet. Yes, it would be great to spread the movie around more. I am so busy working on this book that I hardly have time to do movie promotion. I encourage you and others to share the link on my site. Soon, we will be putting it on YouTube so that it can be more readily shared. So happy for you. I was with you in spirit and hope that I will have the opportunity to see it on the big screen. Art lives! How could one scroll past a subject line like that. When I was reading the post I was thinking there’s a market for girls wanting to make subversive dolls. Next book idea.